Today is Global Oneness Day! Julian and I wanted to let you know that we are again co-sponsoring Global Oneness Day, a very special day that is happening today, Wednesday, October 24th. 2018 Global Oneness Day - coming soon! 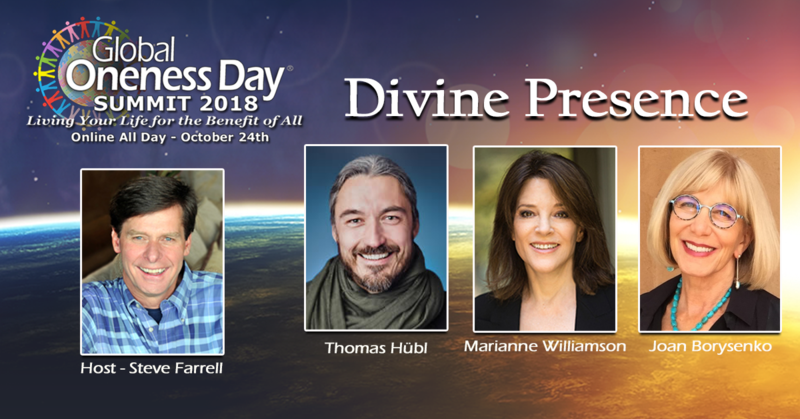 Julian and I wanted to let you know that we are again co-sponsoring Global Oneness Day, a very special day that is happening Wednesday, October 24th. We are excited and inspired to let you know about this years 11 Days of Global Unity Summit – produced by We, The World. We’re inviting you to join in and listen to the incredible array of visionary leaders and attend the live and streamed events on each of the 11 Themes of Change. The 2018 Summer of Peace is ON!! From the TED.com YouTube channel: eL Seed fuses Arabic calligraphy with graffiti to paint colorful, swirling messages of hope and peace on buildings from Tunisia to Paris. The artist and TED Fellow shares the story of his most ambitious project yet: a mural painted across 50 buildings in Manshiyat Naser, a district of Cairo, Egypt, that can only be fully seen from a nearby mountain. Imagine yourself engaged in work that is deeply meaningful and soul-nourishing. Envision a life in which your business acumen and spiritual inclinations are fully merged and expressed. Julian and I wanted to let you know that we are again co-sponsoring Global Oneness Day, a very special day that is just around the corner. This program is the Earth Day for an awakened humanity. It happens October 24th, 2017. Here are just some of the luminaries for the 2017 Global Oneness Day Telesummit: Michael Beckwith, Marianne Williamson, Jean Houston, Doreen Virtue, Nassim Haramein, Panache Desai, Gary Zukav, Ervin Laszlo, Neale Donald Walsch, Barbara Marx Hubbard, Bruce Lipton, Gregg Braden, Lynne McTaggart, Ervin Laszlo among many others. From the TEDx.com YouTube channel: Fred Swaniker has lived and worked in 10 different African countries. He passionately believes that good leadership is the most critical need for the continent. He has founded two organizations that aim to catalyze a new generation of ethical, entrepreneurial African leaders: African Leadership Academy and the African Leadership Network, both fulcrums of leadership training for the continent.